NOTE: This device is not intended to diagnose or treat any conditions. 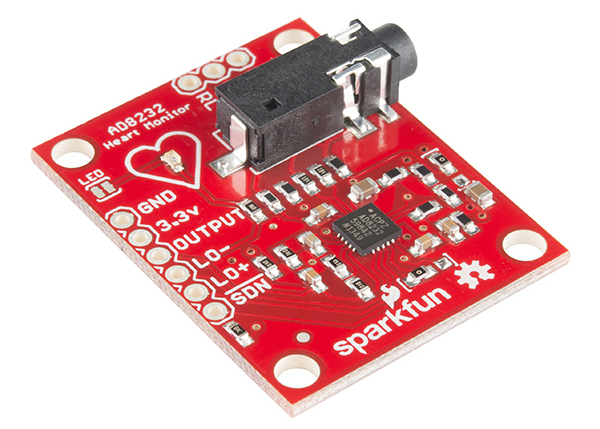 In this tutorial, we will go over the basics for getting your AD8232 Heart Rate Monitor up and running. First, an overview of the board and all its features will be presented. Then, we'll show you how hook it up to your favorite microcontroller and how to create visual data using Processing. If you are not familiar with any of the following concepts, you may want to review them before moving ahead. In general terms, lets look at what an ECG is representing and how we're able to sense it. The ECG is separated into two basic Intervals, the PR Interval and the QT Interval, described below. 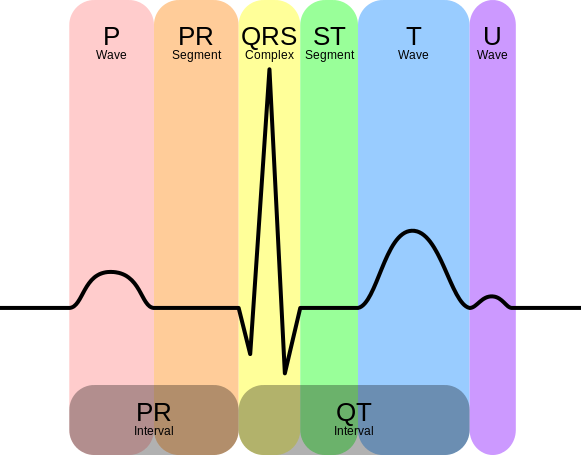 Note: All information comes from the Waves and Intervals section of the ECG Wikipedia page . The PR interval is the initial wave generated by an electrical impulse traveling from the right atrium to the left. The right atrium is the first chamber to see an electrical impulse. This electrical impulse causes the chambers to "depolarize". This forces it to contract and drain deoxygenated blood from both the Superior and Inferior vena cava into the right ventricle. As the electrical impulse travels across the top of the heart it then triggers the left atrium to contract. The left atrium is responsible for receiving newly oxygenated blood from the lungs into the left ventricle via the left and right pulmonary veins. The pulmonary veins are red in the diagram because they are carrying oxygenated blood. They are still called veins because veins carry blood towards the heart. Science! The QT Interval is where things get really interesting. The QRS is a complex process that generates the signature "beep" in cardiac monitors. During QRS both ventricles begin to pump. The right ventricle begins to pump deoxygenated blood into the lungs through the left and right pulmonary arteries. The pulmonary arteries are blue in the diagram because they are carrying deoxygenated blood. They are still called arteries because arteries carry blood away the heart. Science, Again! 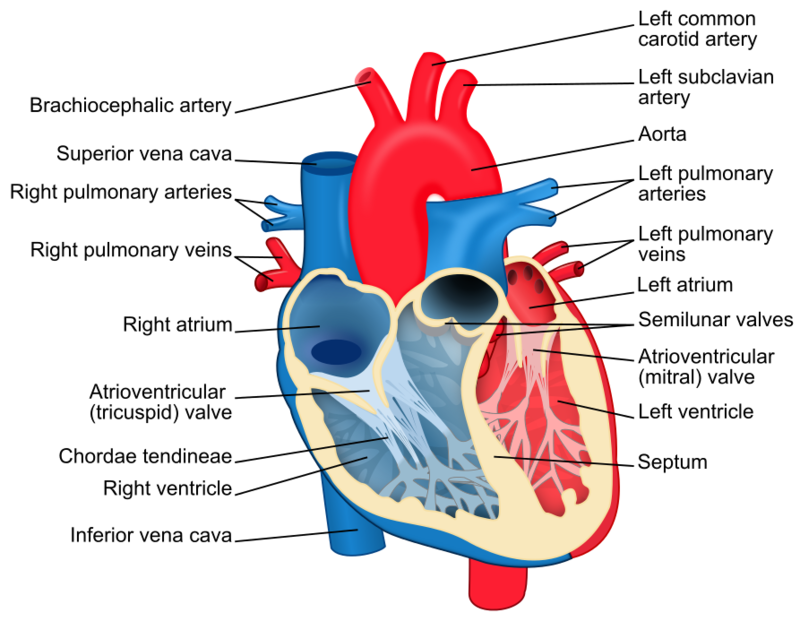 The left ventricle is also begining to pump freshly oxygenated blood through the aorta and into the rest of the body. After the initial contraction comes the ST segment. The ST segment is fairly quiet electrically as it is the time where the ventricals waiting to be "re-polarized". Finally the T wave becomes present to actively "re-ploarize", or relax the ventricles. This relaxation phase resets the ventricles to be filled again by the atriums. In this guide, we'll connect the AD8232 Breakout to an Arduino microcontroller. We will build a simple cardiac monitor that will allow you to measure the electrical activity of the heart in real time!